Tonight Luke decided he wanted to make a cake. 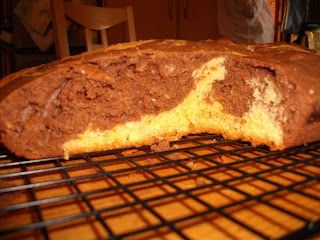 We looked through the recipe book and he decided to have a go at making a marble cake. I helped him start weighing out the ingredients and got as far as mixing them altogether and then Dad took over for the rest of the cake as I had to go out to a PTA meeting! 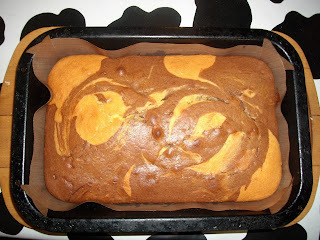 Here is the marble effect inside the cake. It tasted delicious and I'm sure it won't last long.